Banner by The Workshop - thank you! Winter seasonal items and NC items. Check back soon for more updated sections! Birthdays, holidays, or just to say hello - there are plenty of reasons to buy someone a gift! But with all the items in Neopia, sometimes finding a great gift can be a headache. This guide is here to make shopping easier - gifts are arranged by categories and sorted by price range. Click on the item's image to link to the Shop Wizard or Trading Post and find items quickly. 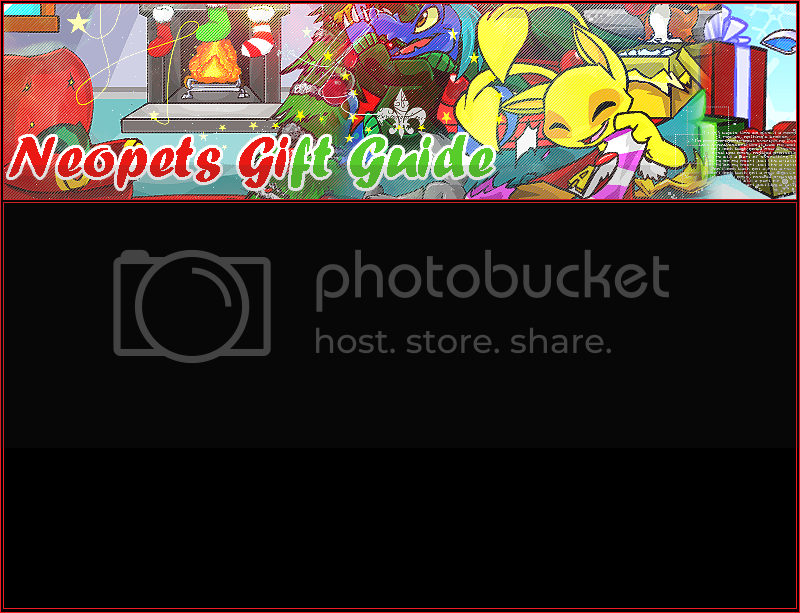 This guide contains only some selected suggestions - Neopia is full of great gifts! While shopping, it's usually a good idea to try to pick out items that look nice. Animated items, or those drawn with a lot of detail, always look expensive, even if you didn't spend a fortune. And keep in mind that unless you're going for a joke, avoid gross foods, odd books, or creepy toys. morphing potions, neggs, bottled faeries, or job coupons are sure to be appreciated by most players. When shopping for someone, their gallery is a great place to start. If they have a wish list, that makes it easy on you! If not, do some research to see if there are items missing from their gallery. Petpets are great, customizable gifts. Try a Neopet / Petpet matching site like this one to get started. If you're not sure what type of petpet they might like, you can send a petpet paint brush that matches their pet. see the Further Resources section at the bottom of the guide for more info. Be wary when purchasing avatar items - it is difficult to tell which avatars a player has without asking. On the plus side, most avatar items are easy to sell if they do already have a certain item avatar. Still can't find something you like? Explore items similar to the ones below using the Neopets Search Feature. For congratulations, thank you's, or just to say hello. There are plenty of budget-friendly items, so I expanded the Under 5,000 NP section. If you don't find what you're looking for, search the site for other cards - there's a variety! When buying for Neohomes, check how a player has their Neohome decorated and buy items to go with the theme. All the items suggested here are also compatible with the new Neohome 2.0 format! There are so many out there, you can always find one that caters to someone's specific interests or Neopets. If you're looking for an edible treat, why not go gourmet? Know someone who's always in the Battledome? Do you want to set someone up with a great set so they can start? Try some of these suggestions, gathered with advice from the BD boards! The clothes featured below can be worn by any species! Remember - NeoCash is the currency you purchase with real money, which you can spend at the Neopian Mall. Love Dr. Sloth? Buying for someone with a unique sense of humor? Check out these unusual items. Thanks to everyone for the wonderful buttons - click each to see the credit! Coding & CSS help from here, here, and here. These are great guides, check them out! Link back buttons are all customs from sites listed.